A mysterious glowing “blob” in outer space has puzzled astronomers for more than 15 years. Now, a team of researchers says it has uncovered the secret behind the blob’s eerie light. At first, they thought they had somehow accidentally screwed up the images. But then they realized they had actually discovered strange, glowing clouds of hydrogen gas. They were huge — about 10 times the Milky Way in diameter — making them some of the largest known objects in the universe. He and other astronomers just couldn’t understand what made the blobs glow. “There was no obvious source that could be illuminating that blob,” says Steidel. 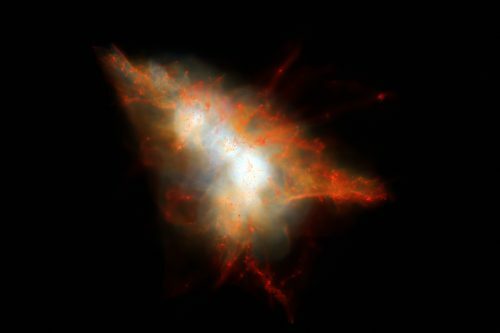 But then a team of astronomers peered into one of the largest, most famous blobs using a powerful telescope in Chile called ALMA. The group found a pair of large galaxies hiding inside the blob. They couldn’t be seen before because they were obscured by dust. These galaxies are producing new stars at a frantic pace — and each is making the equivalent of 100 new suns every year, says Jim Geach, an astronomer at the University of Hertfordshire in the United Kingdom. All this activity is lighting up the surrounding gas — producing the blob, according to a report in The Astrophysical Journal. Others agree that scientists now seem to have a pretty good idea of what powers this one particular blob. Matthew Hayes, an astrophysicist at Stockholm University, says he guesses that if you looked hard enough, with the right kind of telescope, you’d find something like this in, probably, all of the blobs. “These things are still rare. And they’re still kind of strange. But we’re putting it together now, I think,” says Hayes. He adds that while the mystery of the outer space blobs isn’t completely solved, he thinks scientists are getting there. This entry was posted in KRTS News and tagged astronomy, science, Space, stars. Bookmark the permalink.